The elusive white iPhone 4 evaded consumers for months before finally appearing on store shelves – and that long-awaited exclusive first unit was the inspiration for Reba Wong’s amazing DIY Halloween Costume! This clever smartphone costume is made from a piece of foam emblazoned with a sheet of recycled paper printed with apps so that it looks like the iOS homepage, and the top of the phone is made from an old headband and a toque. If you’re a fan of this brilliant costume then vote for it now in Inhabitots’ Green Halloween Costume Contest – which ends tonight at 11:59 pm EST! 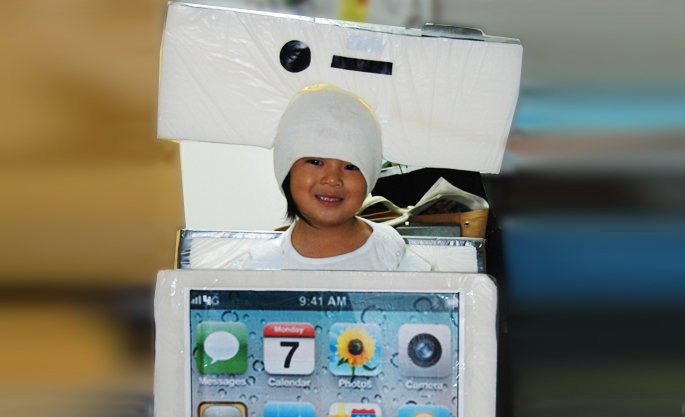 The elusive white iPhone 4 evaded consumers for months before finally appearing on store shelves - and that long-awaited exclusive first unit was the inspiration for Reba Wong's amazing DIY Halloween Costume! This clever smartphone costume is made from a piece of foam emblazoned with a sheet of recycled paper printed with apps so that it looks like the iOS homepage, and the top of the phone is made from an old headband and a toque. If you're a fan of this brilliant costume then vote for it now in Inhabitots' Green Halloween Costume Contest - which ends tonight at 11:59 pm EST!